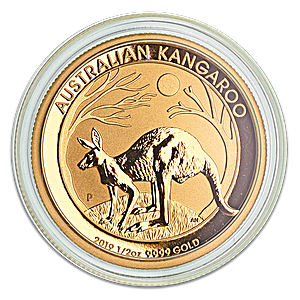 The 0.5 oz Gold Kangaroo coin is a gold bullion coin produced by Australia's Perth Mint. Each coin weighs 1/2 troy ounce and has a gold purity of 99.99% pure gold. Each year, the iconic kangaroo imagery on the Kangaroo Gold Bullion series of coins is updated, which explains the coin's popularity with both collectors and gold investors alike. For 2019, the obverse of the 1/2 oz gold Kangaroo features a kangaroo standing on a mound of grass with a sun and stylised trees as a backdrop. The imagery is inscribed at the top by the words 'AUSTRALIAN KANGAROO', and includes a ‘P’ mint mark signifying Perth. 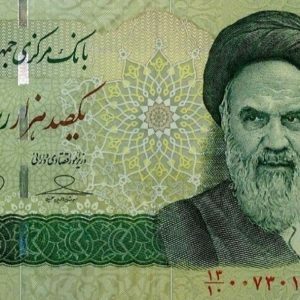 The obverse also displays the coin's year '2019', weight '1/2 oz', and the coin's purity '9999 GOLD' . 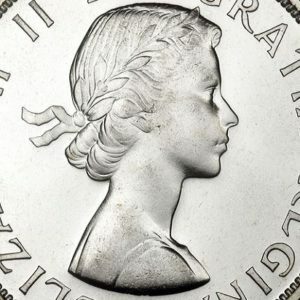 The Australian Kangaroo gold bullion coin series was first issued in 1990, but is officially called the 'Australian Nugget Kangaroo Gold Bullion Series' since from 1987 to 1989 a similar coin with imagery of famous Australian gold nuggets was issued. This explains why Perth Mint gold Kangaroo coins are sometimes referred to as 'Australian Gold Nugget' coins. 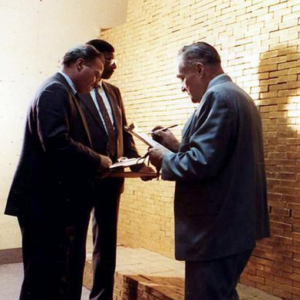 Formerly a branch of the Royal Mint, the Perth Mint is now fully owned by the Western Australian government, and the Perth Mint stands over the purity and authenticity of every gold bullion coin leaving its minting facility.